Records show he was born 15 March 1898 at Cappagh, Tipperary. A John Joseph Fitzgerald birth registration was made in Tipperary Reg District Apr - Jun 1898. He was the son of a Tipperary doctor, Dr Joseph Fitzgerald, a poor law dispensary Medical Officer at Cappawhite Dr Joseph Fitzgerald was president of the athletics branch of the GAA in Cappawhite from 1895 to 1909. There is a John Fitzgerald aged 14 in the 1911 census at Rockwell College, one of the principal catholic scholastic establishments in the south of Ireland, is situated in this district, on the road between New Inn and Cashel in Tipperary. This might be him. The 1911 census shows his father Joseph Fitzgerald Age 52, a widower, living with children, May Fitzgerald Age 20, Edward Fitzgerald Age 10, Joseph Fitzgerald Age 7, Agnes Fitzgerald Age 3. So John Fitzgerald was not at home that day. I suspect that he attended Blackrock College, one of the chief mouners was a priest from that College, and both Blackrock and Rockwell are part of the same group of schools. The medal card established that John Joseph Fitzgerald was in the Royal Irish Regiment and went on to serve in RFC during the war. I have not been able to find him in Royal Irish Regiment. If he served with them it probably would have been in 6th Battalion, formed at Clonmel on 6 September 1914 and took part in the Somme campaign. With 60 Sqn RFC, 2/Lt. J J Fitzgerald on 5 October failed to return from an Offensive Patrol while flying SE 5a B507 'A', he suffered engine failure over Bavichove and landed behind the German lines. There are photographs of B507 in German hands in Sturtivant & Page's The SE File and Les Rogers' British Aviation Squadron Markings of World War I. Contrary to a statement made about Fitzgerald, SE5a B507/”A”, Vickers built, wasn't the first SE 5a captured by the enemy. He landed his S.E. 5a on the airfield of Jasta 18 at Harlebeke and was taken POW. 1919 May 12 His service record shows him posted to Russia. He served as a flight commander in Russian Expeditionary force in no2 Squadron, one of the three Slavo-British Squadrons that ended up sharing the airfield at Bereznik. No 2 Squadron was commanded by R C Carr . 22 May 1919 Embarked on barges towed by steamers. 1919 Sep 11. Returns from Russia for "disposal"
1919 Oct 20 He was transferred to unemployed list. 1920 Jun 1. He joined the RIC with the service number 71614, and served as a Barracks Defence Officer in Co Clare. 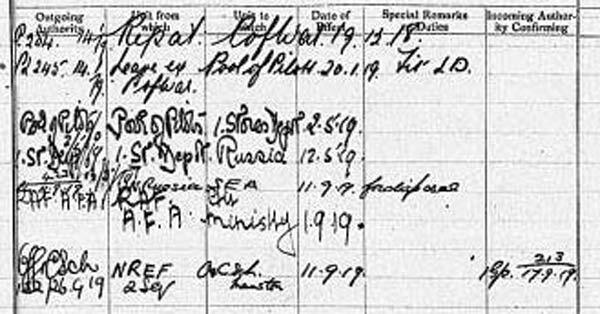 RIC records show him as aged 22 and a sergeant when he was assassinated. 1920 Oct He was described as an ex-military officer, and had served as a barrack defence officer in the RIC in Co. Clare. Whilst on that duty he had been kidnapped. He was placed against a wall and shot with his own revolver, but he was not badly injured, and dropped to the ground pretending to be dead. He was then able to take the opportunity to escape by climbing over a wall. This incident appears to have been in October 1920. 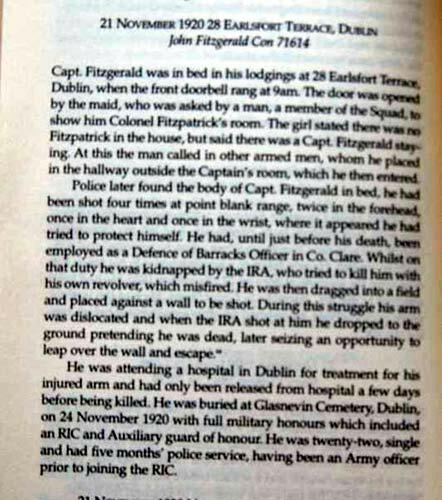 The Mid Clare Brigade of the IRA say Captain John Fitzgerald RIC Number 71614 From Cappawhite, Co. Tipperary was assassinated by the I.R.A. 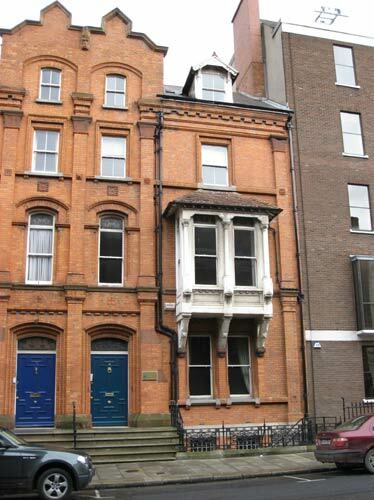 on Bloody Sunday in his lodgings at Earlsford Terrace had been stationed in Clare as an R.I.C. Barracks Defence Sergeant. Fitzgerald had been captured and interrogated by the I.R.A., was court-martialled and sentenced to death. He was taken to a field and placed against a wall for execution. At the last moment clambered over the wall and though wounded made good his escape. After recovering from his wounds he was transferred from Clare to Dublin for his own safety. He had gone to Dublin to have his arm wounds attended to in a Dublin hospital. John Joseph Fitzgerald had been living in the house for about a month and was only a few days out of hospital and still confined to bed when he was assassinated. The Irish Times report on Monday November 22nd 1920 says 14 persons were killed and 5 injured. And that 10 of the dead were officers. And that they were " in one way or the other connected with the administration of justice, the collation of evidence and the prosecution of prisoners before courts-martial. " 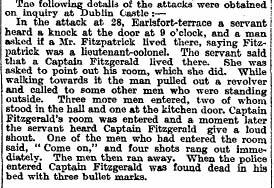 The Irish Times report goes on to describe the murder of Captain Fitzgerald. It reports that at about 9am on Sunday morning 21 November, a man knocked on the door of 28 Earlsfort Terrace, which was opened by a maid . 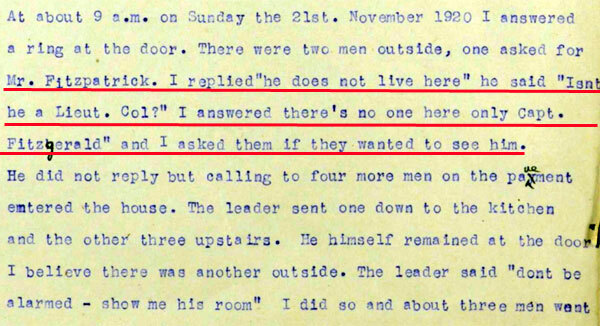 He asked her if Mr Fitzgerald lived there ( reports in other papers that day have slight variants on this. One says that the man asked for "Colonel Fitzgerald", another says he asked for "Captain Fitzgerald", another for "Fitzpatrick". He asked her to show him Fitzgerald's room and pointed his revolver at her. There were seven men at the door (another report in the Irish Times the next day says 20 men) , and two of these entered the hall. The first man went to Mr Fitzgerald's room, and a moment later the servant heard Captain Fitzgerald utter a loud shout. She then heard someone say "Come on". Four shots rang out, and the man left the room at once and ran away, the others followed him. Interestingly Thornton's Witness Statement says the man killed was "FitzPatrick"
The police arrived shortly afterwards and found Captain Fitzgerald dead in his bed in a pool of blood, his forehead shattered with bullets, one in the heart and one to his right wrist as if he had held it up to protect himself. All shots had been fired at point blank range. The officer was unarmed.. Another report says he received 4 bullets, one to the hand, two to the head and one to the heart. 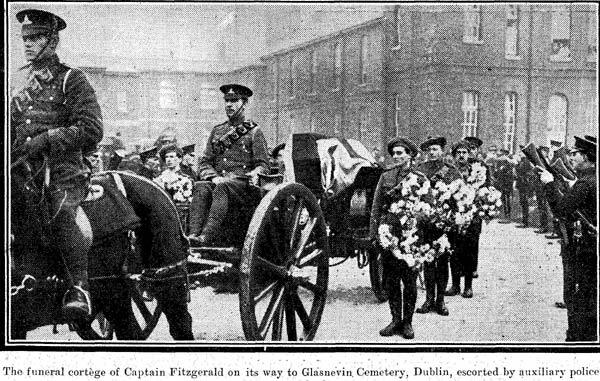 Captain Fitzgerald (The Irish Times refers to him as "Captain" in all their reports) RIC, was buried at noon on Wednesday 24th November 1920. A guard of honour was provided by the RIC. The funeral procession went from King George V Hospital, passing through lines of RIC and Auxiliary Police along Western Avenue to Glasnevin Cemetery. His grave is not recorded as a Commonwealth War Grave, but he had left the British Army by then. It was led by the band of the RIC with muffled guns. The coffin was covered by the Union Jack and carried on a gun carriage. The pall bearers were members of the Auxiliary Force and carried numerous wreaths. An RIC firing party followed with rifles reversed. Then followed detachments from both forces. Relatives and immediate family travelled in closed carriages. After prayers were said at the graveside, the Last Post was sounded and a volley fired. A reading of articles by both sides fails to reveal any perpetrators. Most of the murders have the names given by the Irish side after independence, but not Fitzgeralds murders. One wonders why. Who did the assassins actually ask when they entered Earlsfort Terrace. For "Mr", "Captain" or "Colonel" and was it "Fitzgerald" or "Fitzpatrick". The maid who answered the door is clear it was "FitzPatrcik"
1920 Noreen Fitzgerald was a VAD nurse in 3rd General Hospital in Walworth, was at funeral of her brother Capt Fitzgerald. 1932 on 22 Apr 1932 Dr J A Fitzgerald of West African Medical Service, son of late Dr Joseph Fitzgerald of Cappawhite, married Gwyneth Webber in Lagos, Nigeria.